As Brandfolder moved upmarket and gained traction with more enterprise clients, it became clear that the company outgrew its website. Now that Brandfolder is a major player in the Digital Asset Management (DAM) space, it needed a website to match its platform — powerfully simple, sophisticated yet approachable, and able to cater to clients with thousands of assets and complex DAM requirements. I was tasked with revamping the Brandfolder homepage — from writing new copy, to reorganizing the sitemap, to sketching wireframes of key pages, to creating the final design in our content management system (CMS). I had the support of my manager, whom I collaborated with and acquired feedback from, a developer, who implemented custom code in our CMS, and a design contractor, who created custom illustrations and graphics. In this case study, I'll walk through key steps in my design process. Note: To comply with my non-disclosure agreement, I have omitted confidential information in this case study. This information in this case study does not necessarily reflect the views of Brandfolder. Based on our current website, what does Brandfolder do? What problems do you think Brandfolder solves? What drew your attention first from our homepage? Who do you think our target audience is? If you were purchasing a DAM and considering Brandfolder as a potential platform, where would you navigate first? 100% of users interviewed were able to identify what Brandfolder does. They understood that Brandfolder is a platform for managing and sharing digital assets, and that we serve marketers and teams across various industries. The Brandfolder tagline and the site's clear, strong branding played a major role in this — proving that these are elements we should keep throughout the redesign. Pushing users to a "Get Quote" CTA is aggressive when users don't have enough information or aren't ready to purchase Brandfolder. A CTA like "Get Started" would be better, which could link to detailed information about our platform, Brandfolder resources, or a Brandfolder demo. Users like seeing real Brandfolders in action. Showing, rather than telling, is a great way to deliver value. We need to better showcase Brandfolder resources more prominently, which 100% of users interviewed agreed is currently difficult to find. This will make it easy for users to gather information and ultimately coerce them through the sales funnel. 75% of users interviewed agreed that clients are another big selling point. Our new website should feature the companies we serve, and explain how we serve them "above the fold." "Support" and "Integrations" are also big selling points that are missing from the current website. 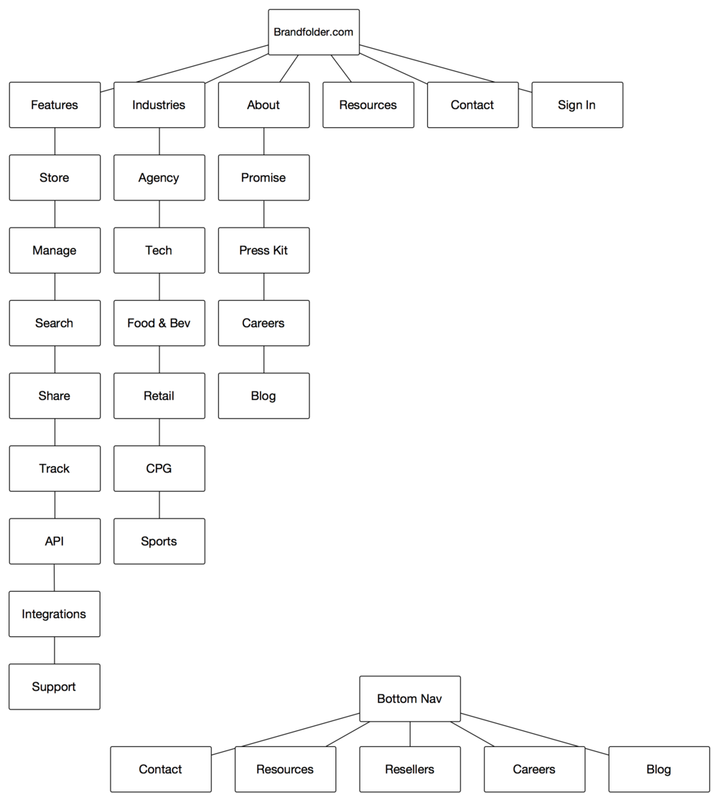 Armed with insights from the focus group, I created a sitemap for the new Brandfolder website. Using this information, as well as inspiration from other enterprise software websites, I sketched out key pages for our new website — "Industries," "Features," and the new homepage. Considering the short timeframe and small team, I decided that high-fidelity wireframes were not needed. Instead, I ran the sketches by my manager and our developer, and loaded the content into Squarespace, our CMS of choice. The redesigned website is currently live at: www.brandfolder.com.